Salvation And Survival: What Kind Of Faith Will Jesus Find When He Returns? What Kind Of Faith Will Jesus Find When He Returns? At this dawn of the year 2018, I am seeing lots of prophetic warnings coming forth from the Body of Christ. As far back as 2010, when Mark and I were part of an exceptional group of Believers in a Sunday School class called Spiritual Readiness For the End Times, I remember class members being interested in comparing the prophetic warnings in the Bible with what we were seeing on the world stage. As generations have done for centuries before us, the topic of the Return of the Lord was one of the most debated. And although we all knew that no man knows the hour or the day, I think it is human nature to prognosticate based on Jesus's words, as well as the prophets. At one particular time, emboldened Believers were looking at the occurrences of the Blood Red Moons in history and connecting the dots to significant events in the history of God's chosen people. And, though it seemed far in the future, 2018 was marked as a crucial year ... and here we are. One of the most daunting prophetic messages has come from Bill Yount, an itinerant pastor of sorts, who states that his calling "is to encourage the Body of Christ to move forward into God's Destiny as they are sent into the Harvest field". He often receives a prophetic word from God, and for the year 2018, he has heard the Father saying, "Batten down the hatches"! Here is what his message is specifically about: "I sense 2018 will be a year of 'everything at once'. All hell will break loose and all of heaven will break loose, but heaven is greater than hell. I sense the presence of a great cloud of heavenly witnesses, including family members, standing to cheer us on this coming year. The eyes of heaven are upon us, waving checkered flags in the distance. The heavens are shouting, 'Don't lose your excitement for what God has called you to do'. Your excitement excites Him and activates the angels among you. Excitement is a powerful weapon against the enemy, as it ties his hands." And now I want to get to the heart of this post. How many of the Body of Christ do you think would read Mr. Yount's prophetic word and pronounce it, for lack of a better word ... crazy? How many believe that God no longer speaks to prophets in our day and therefore we are not to listen to such warnings or exhortations? How many are hesitant to even call statements like this "prophecies" for fear that it somehow dishonors the prophets of the Bible? Instead, they might call them predictions or even (gasp) fortune-telling. How many faithful Christians would say this is excessive and has no place in the ministry of the Church today? But I would ask, does God love us any less than He did the faithful throughout the ages? If He sent prophets with timely words of warning then, why would we think that He would not speak through prophets today? But just as then, there are skeptics today. Here is the most common argument I have run across: The early Christians did not have the complete Bible. Some early Christians did not have access to any of the books of the New Testament. The New Testament prophets “filled the gap” by proclaiming God’s message to the people who would not have access to it otherwise. The last book of the New Testament (Revelation) was not completed until late in the first century. So, the Lord sent prophets to proclaim God’s Word to His people. If the purpose of a prophet was to reveal truth from God, why would we need prophets if we have the completed revelation from God in the Bible? If prophets were the “foundation” of the early church, are we still building the “foundation” today? I want to make it perfectly clear that any prophecies made today must be tested by Scripture. But I also believe that Paul makes it obvious that prophecy comes from God. In fact, he says in 1 Corinthians 14:1, "Pursue love, yet desire earnestly spiritual gifts, but especially that you may prophesy". And I really like how the Passion Translation renders his words in 1 Thessalonians 5:20: "Never restrain or put out the fire of the Holy Spirit. And don't be one who scorns prophecies, but be faithful to examine them by putting them to the test, and afterward hold tightly to what has proven to be right. Regard everything seriously and do what is best, avoiding every appearance of evil". [The Passion Translation translates from the Aramaic, which was what many of the manuscripts were written in. We lose so much in the literal Greek translations]. Here is what is important for us to realize... Prophecy is a valid gift of the Holy Spirit needed by the church today. There is no place in Scripture or church history that indicates the gift of prophecy has ceased or disappeared. The argument in the preceding paragraph comes from man's mind, not the mind of God; nor can you find that argument in Scripture. Prophecy is an active function of the Holy Spirit in the church around the world . We must not ignore, despise, or scorn any true gift of the Holy Spirit. We need prophets and prophecy to keep the fire (inspiration) of the Holy Spirit burning in our hearts. Just as in the days of the prophets of old, we need to be rightfully discerning the words of today's prophets. Do they reflect the nature and character of God as supported in the Bible? Now, I have no doubts that there will be many Christians who are secure in their faith, yet are offended by another Believer whose faith has shown them that God still talks through prophets today. 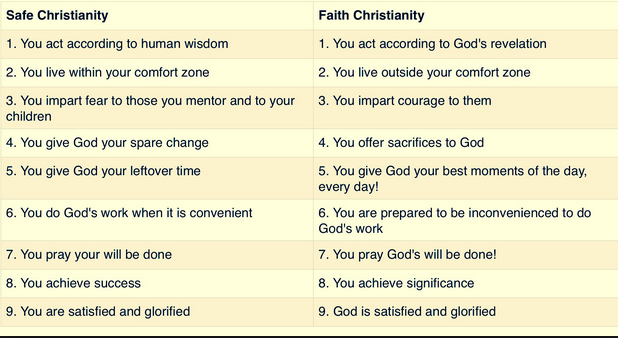 Christians with the latter kind of faith threaten our comfort zones, don't they? Those who are made nervous by this kind of "radical" faith often opt for a "middle of the road" position; a place within their Church doctrine where they feel safer and less threatened. But here's the problem with this approach ... does this lead to the lukewarm Church that Jesus warns us about in Revelation? And does this kind of apprehension eventually lead to doubt and unbelief? By playing it safe and renouncing the possibility that God still talks through prophets, are we playing into the hands of the devil? In the words of Bill Johnson, "Unbelief is safe because it takes no risk and almost always gets what it expects". Furthermore, how does such unbelief serve the Body? Whether it is unbelief in the gift of prophecy, the ministering of angels, our power and authority to defeat the schemes of the Enemy -- it doesn't matter. If we, as the Body of Christ, are afraid of being deceived, and are willing to stay on safe, middle ground, then we run the risk of limiting the benefits of such knowledge to our fellow Believers and the Lost. We produce less fruit for the Kingdom, and we certainly are no threat to satan. That is why Jesus's question in Luke 18:8 should give all of us pause .. It comes after He has shared the parable of the widow receiving justice from the unjust judge. The point of this parable is that the widow was persistent in demanding justice, and the unjust judge finally awarded it to her to make her go away. Here's the part of Scripture I want us to pay attention to: The Lord continued, "Did you hear what the ungodly judge said -- that he would answer her persistent request? Don't you know that God, the true judge, will grant justice to all of His chosen ones who cry out to Him night and day? He will pour out His Spirit upon them. He will not delay to answer you and give you what you ask for. God will give swift justice to those who don't give up. So be ever praying, ever expecting, just like the widow was with the judge. 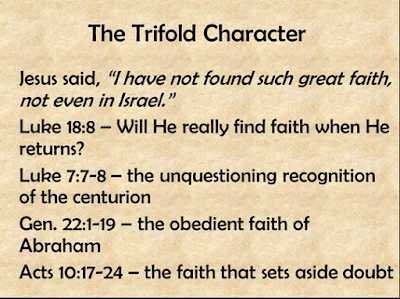 Yet when the Son of Man comes back, will He find this kind of persistent faithfulness in His people? Will He find a Church and Body that is willing to believe in ALL that the Word tells us, and who is unwilling to be shackled by the limitations of our doctrinal "sacred cows"? Will He find Believers who have been willing to accept the calling He has invited them to, and are excited to be working with Him to bring about the fulfillment of God's Kingdom on earth? Will He find true Disciples whose aggressive faith is contagious and aren't afraid to shine His Light into every dark corner of this world? And will He find a strong and growing Remnant who, like the widow, know the eternal inheritance they are due and are willing to fight tooth and nail for it, never giving up; who know what "batten down the hatches means" -- it means focus on Jesus and His return. Pray like the widow did; be persistent in your prayer and your calling. And above all else, listen for Him to speak to you; both individually and personally, and through prophets whom He has chosen to communicate His will. I am probably going to offend some people with this statement, so I hope that I word it to reveal my true heart ... I believe the Bible is the inerrant Word of God, and I believe that it includes all the inspired writings that He commanded. But I also believe that our God is bigger than the words on those pages. I believe He has given us the Bible in order that we will seek Him out; seek more of Him than words can give us. For those who believe that the Bible is the complete revelation of God, I have this to say ... (John 21:25) Now there are also many other things that Jesus did. Were every one of them to be written, I suppose that the world itself could not contain the books that would be written. This verse alone tells me that God, Jesus, and the Holy Spirit are waiting for us to engage with them beyond what the Bible reveals. The Bible is an accurate and true picture of the God we serve, but I believe that it doesn't contain all that He is or display the full extent of His Magnificence and Power. So, I guess in the end I am left with a certain sense of frustration ... for those who want to keep God in a box and for those who are unable, for whatever reason, to see our full potential and what it looks like to "be in Christ". It is my prayer that God's Spirit would rest on everyone who calls themselves Christian, and that there will be those who will accept the mantle being placed on their shoulders and walk in obedience [in their power and authority] to effect change in this world for the Kingdom. I will pray for those Christians who are satisfied in their doubt and skepticism, and willing to follow Jesus from a distance; who are more interested in refuting Scripture's clear mandate than taking the risk to follow Jesus in an uncommon and risky manner. But here's the thing ... I don't want to have religious arguments. That's living like the Pharisees. I want everyone to see the Light of Jesus in the uncommon ways He is calling out His own. I want them to be unafraid and be willing to risk everything ... their reputation, their church friendships, their families, their jobs ... everything for the sake of being obedient to Jesus! I want us all to press toward the goal of our holy calling, and be completely possessed by the Holy Spirit to do the works God has prepared for us since the foundation of the world. That's the kind of faith that I want Jesus to see when He returns! John 15:15 "No longer do I call you servants, for the servant does not know what his master is doing; but I have called you friends, for all that I have heard from my Father I have made known to you". Agree with your total discourse. The Bible is the inerrant word of God -but for Heaven's Sakes, why do so many think God has stopped talking. Reminds me of my wife and I having updated our will - those are our final words on the matter of disposition ... BUT ! - we still intend to communicate with all the heirs until that final day . I am reminded of how Christ said we would have to be willing to put aside our family if need be to be a true follower of him. Haven't had to do that and don't look forward to it - but looking at the world - we may soon face that choice. There is so much that we Christians are "leaving on the table", so to speak, as far as what is available to us through radical faith. Father, show me all that You have in store for me if I will just trust You!